Contract customers receive a 5% discount on all parts purchased for the duration of contract. Protection Against Unscheduled Downtime – Preventative maintenance inspections will help predict component failure, spot wear items or improperly maintained areas, and allow repairs to be scheduled before they become failures. Reduced Emergency Visits – Downtime is costly no matter when it occurs. But emergency service visits can unnecessarily add to those costs due to last minute airfare or technician overtime. Prescheduled PM visits allow you to maintain better cost control and reduce the need for emergency visits and repairs. Improved Operation and Efficiency Through Ongoing Operator and Maintenance Training – PM visits are training and education opportunities, keeping operators and maintenance personnel skills at top levels, correcting bad habits, and training new personnel. Unlike emergency visits, regularly prescheduled PM visits provide plant management the ability to schedule the necessary personnel and resources to ensure that training is consistent, thorough, and effective. Maximize Performance – These inspections are equipment “tune ups” to verify that all systems are operating at original factory specifications and provide insight into the details that may not seem impactful, but can contribute substantially to inefficiency and operational downtime. Programs and firmware will be reviewed and updated to the latest version. Predictable Maintenance Costs – Once you budget a service contract you can estimate what your costs are going to be for the year. Better Control and Cost ofInventoried Spare Parts – As part of the preventative maintenance visit we will review your parts inventory and recommend what should be stocked. Additionally, we will review your annual spare parts spending with you and make suggestions as to possible savings. Priority Service – As part of this service contract you will receive priority service over non-contract customers should you require an emergency service visit. Unlimited telephone support is also included. Remote connection and monitoring can be quoted for the utmost in service support. Line Optimization and Operational Review – The service engineer will observe all facets of the line operation, not only the equipment, but all the operations associated with the process. He will make recommendations on how to improve efficiency and increase throughput. Service Report – A detailed service report is provided to you upon completion of each PM visit listing findings, performance recommendations, and uptime improvements. As part of the PM visit we will review any available Maintenance Logs on the equipment to help identify any recurring issues, and offer suggestions to resolve. If you are interested in learning more about a Pacproinc® preventative maintenance contract, please contact a member of our service department or your sales representative. All Pacproinc® equipment manuals include detailed drawings and bills of materials to assist in identifying and ordering spare parts. We also include recommended spare parts lists to help identify critical parts, further reducing potential downtime. Our parts department is available to help you identify and order any required parts quickly. Our fully stocked parts department offers same-day shipment on all orders received by 3:00 p.m. eastern time. Emergency shipment requests are available after 3:00 p.m. on weekdays, and during weekends and holidays, but these may be subject to additional courier, expediting, and handling fees. Rebuilding/Reconditioning: In addition to our emergency breakdown service, our highly skilled technicians specialize in rebuilding equipment used in portion control processing, including slicing, forming, interleaving, stacking and conveying machines. Pacproinc® service bulletins are designed to keep you informed of important changes to your machinery and outline new or updated maintenance procedures, special kits or parts upgrades. We hope that by informing you of these improvements and upgrades, you will experience fewer periods of unplanned down-time and improve the overall performance of your equipment. If you have any questions about one of our bulletins, please contact our Parts or Service Departments at 610.489.8601. 24/7 Service: Our technicians are available 24 hours a day, 7 days a week to assist you in any service- related need. Whether it’s emergency breakdown service, troubleshooting and repair, or preventative maintenance, Pacproinc® responds quickly, limiting your downtime and keeping your production on schedule. Installation & Training: We offer complete installation and commissioning services for all our equipment solutions. In addition, our technicians provide classroom and hands-on training for your operations, maintenance, and sanitation personnel—in our facility or yours. Our Help Desk System is designed to provide a central tracking point for all customer issues allowing efficient escalation to the correct department. Once your call has been assigned a case number, all of our customer service team members are able to provide the support required to address your specific issue. The Pacproinc® Arc-Tronic® is an electronic film-hole perforating system that solves the frequent problems presented by hole-punchers in shrink-wrap applications. With no moving parts, no need for contact with the film, and adjustable hole diameter, the Arc-Tronic® sets the standard for film perforating. 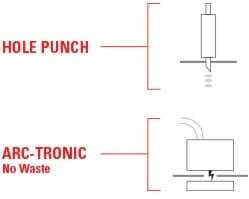 Because it’s not a punch, there are no tabs, scrap pieces, or waste to contaminate product after perforating. The solid-state design requires no expensive punches or dies, the round/oval hole edges seal instantly after perforating to prevent “zippering” as a result of torn film, and a simple knob adjustment means users can make fast, on-the-fly changes from 1/8” to 3/8”. Installation is fast and easy. All Arc-Tronic® kits include illustrated instructions, so it’s fast and easy for plant maintenance personnel to add the perforating system to existing packaging machines. High-performance upgrades are available for extra-thick/special film compositions, and the system is capable of perforating films at speeds up to 120 feet/minute. Add it up, and you have a system that delivers consistent performance, eliminates waste-related contamination worries, and saves money. Pacproinc® can help food service plant managers solve labor issues while cutting costs and increasing efficiency and safety.